Garlic sauce is a sauce prepared using garlic as a primary ingredient. It is typically a pungent sauce, with the depth of garlic flavor determined by the amount of garlic used. The garlic is typically crushed or finely diced. 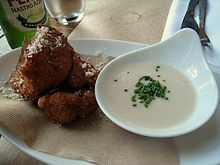 Simple garlic sauce is composed of garlic and another ingredient to suspend the tuber via emulsion, such as oil, butter or mayonnaise. Various additional ingredients can be used to prepare the sauce. Garlic sauce can be used to add flavor to many foods and dishes, such as steak, fish, seafood, mutton, chops, chicken, eggs and vegetables. It is also used as a condiment. Agliata is a savory and pungent garlic sauce and condiment in Italian cuisine used to flavor and accompany broiled or boiled meats, fish and vegetables. It is first attested in Ancient Rome, and it remains part of the cuisine of Liguria. Porrata is a similar sauce prepared with leeks in place of garlic. Aioli is a Mediterranean sauce made of garlic and olive oil; in some regions other emulsifiers such as egg are used. The names mean "garlic and oil" in Catalan and Provençal. It is particularly associated with the cuisines of the Mediterranean coasts of Spain (Valencia, Catalonia, the Balearic Islands, Murcia and eastern Andalusia), France (Provence) and Italy (Liguria). Filfil chuma is a North African recipe from Libyan Jews that is made from sweet and hot pepper powder, heaps of ground garlic, caraway, and cumin. It is used as a dipping sauce much like in Ethiopian cuisine, as a marinade for meat, or as a base seasoning for things such as stew and sauces. Honey garlic sauce is a sweet and sour sauce that tastes like a mix between honey and garlic, popular in Canada. Honey garlic is one of the many sauces put on chicken wings, ribs and other foods such as meatballs. In Cuban cuisine, mojo applies to any sauce that is made with garlic, olive oil or pork lard, and a citrus juice, traditionally bitter orange juice. It is commonly used to flavor the cassava tuber and is also used to marinate roast pork. Without oregano, the sauce is typically called 'mojito' and used for dipping plantain chips and fried cassava (yuca). To create the marinade for pork, the ingredients are bitter orange juice, garlic, oregano, cumin, and salt. Garlic is also used as an ingredient in other preparations of mojo in various cuisines. Mujdei is a spicy sauce in Romanian cuisine made from garlic cloves crushed and ground into a paste, salted and mixed with water and vegetable oil. Sunflower oil is almost always used. Skordalia is a thick puree (or sauce, dip, spread, etc.) in Greek cuisine made by combining crushed garlic with a bulky base—which may be a purée of potatoes, walnuts, almonds, or liquid-soaked stale bread—and then beating in olive oil to make a smooth emulsion. Vinegar is often added. Taratoor is a creamy garlic sauce in Arab cuisine of the Persian Gulf and French cuisine that is a predecessor to aioli. It was first prepared in the Greater Syrian region by peasants. It was later brought to the Iberian peninsula by Phoenicians, and was also brought to the Iberian peninsula at a later time by Arabs. From there, the sauce was brought to Southern France. Taratoor has been described as "an integral part of the Arab Gulf countries' cuisines". Tomato-garlic sauce is prepared using tomatoes as a main ingredient, and is used in various cuisines and dishes. In Italian cuisine, alla pizzaiola refers to tomato-garlic sauce, which is used on pizza, pasta and meats. Toum is a garlic sauce common to the Levant. Similar to the Provençal aioli, it contains garlic, salt, olive oil or vegetable oil, and lemon juice, traditionally crushed together using a wooden mortar and pestle. ^ "...dressed with a fragrant taa'leya, an Egyptian mixture of spices fried with garlic." ^ David, E.; Child, J.; Renny, J. (1999). French Provincial Cooking. Penguin twentieth-century classics. Penguin Publishing Group. p. 137. ISBN 978-1-101-50123-8. Retrieved July 29, 2017. ^ a b c d e f Salloum, H.; Lim, S. (2012). Arabian Nights Cookbook: From Lamb Kebabs to Baba Ghanouj, Delicious Homestyle Arabian Cooking. Tuttle Publishing. p. 27. ISBN 978-1-4629-0524-9. Retrieved July 29, 2017. ^ May, T. (2005). Italian Cuisine: The New Essential Reference to the Riches of the Italian Table. St. Martin's Press. p. 25. ISBN 978-0-312-30280-1. Retrieved March 4, 2016. ^ Capatti, A.; Montanari, M.; O'Healy, A. (2003). Italian Cuisine: A Cultural History. Arts and Traditions of the Table: Perspe. Columbia University Press. p. 36. ISBN 978-0-231-50904-6. ^ Crocetti, Adri Barr (April 18, 2015). "A Heritage Pasta". L'Italo-Americano. Retrieved March 4, 2016. ^ "PORRATA: Vocabolario della Crusca, Firenze - 4° edizione (1729-1738)". ^ Goodman, M.; Holland, L.; McKinstry, P. (2006). Food to Live by: The Earthbound Farm Organic Cookbook. Workman Pub. p. 224. ISBN 978-0-7611-4389-5. Retrieved July 29, 2017. ^ Richard, S. (2009). Dinner Survival: The Most Uncomplicated, Approachable Way to Get Dinner to Fit Your Life. Cooking for the rushed. Simon & Schuster. p. 74. ISBN 978-1-4165-4364-0. ^ Mintz, Corey (April 6, 2016). "How I learned to butcher a piggy for market". thestar.com. Retrieved April 19, 2016. ^ Books, Madison; Andrews McMeel Publishing, LLC; Kummer, C. (2007). 1001 Foods To Die For. Andrews McMeel Publishing. p. 385. ISBN 978-0-7407-7043-2. Retrieved July 29, 2017. ^ Albala, K. (2011). Food Cultures of the World Encyclopedia [4 volumes]: [Four Volumes]. ABC-CLIO. p. 1-PA94. ISBN 978-0-313-37627-6. Retrieved July 29, 2017. ^ Planet, L. (2017). Lonely Planet Romania & Bulgaria. Travel Guide. Lonely Planet Publications. p. 593. ISBN 978-1-78701-066-6. Retrieved July 29, 2017. ^ Wright, C.A. (2001). Mediterranean Vegetables: A Cook's ABC of Vegetables and Their Preparation in Spain, France, Italy, Greece, Turkey, the Middle East, and North Africa with More Than 200 Authentic Recipes for the Home Cook. Harvard Common Press. p. 170. ISBN 978-1-55832-196-0. Retrieved July 29, 2017. ^ "New Statesman". Volume 113. Statesman and Nation Publishing Company. 1987. p. 36. ^ Smith, A. (2013). The Oxford Encyclopedia of Food and Drink in America. The Oxford Encyclopedia of Food and Drink in America. OUP USA. p. 678. ISBN 978-0-19-973496-2. Retrieved September 6, 2016. ^ Anderson, B. (2001). The Foods of Italy: The Quality of Life. Naturalmente Italiano. Italian Trade Commission. p. 154. Retrieved July 29, 2017. ^ a b Kapur, K. (2014). A Chef in Every Home: the complete family cookbook. Random House Publishers India. p. pt90. ISBN 978-81-8400-555-4. Retrieved July 29, 2017.